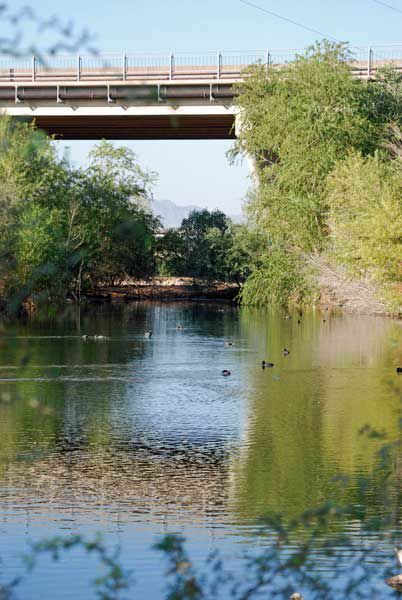 What is the Rio Salado Habitat Restoration Area? The Rio Salado Habitat Restoration Project in Phoenix was created to restore the habitats that were historically associated with the Salt River. The nearly 600 acres of the Rio Salado Habitat Restoration Area stretches along five miles of the Salt River, from 19th Avenue to 16th Street, just south of downtown Phoenix. The Rio Salado Habitat Restoration Project is an ongoing effort to restore the native wetland and riparian habitats of the Salt River, replacing what had become a waste disposal area with an ecosystem supporting both flora and fauna. People are an important part of the restoration project. It includes a ten-mile trail system, staging areas for bikers, equestrians and hikers, and facilities for educational programs for schoolchildren to learn about riparian ecosystems and participate in the project. Rio Salado Habitat Restoration Area Factoid: This area of downtown Phoenix was previously a dump. The debris removed from the area at the start of the project included more than 1,000 tons of tires. What Can People Do Here? The Rio Salado Habitat Restoration Area has programs, typically in the non-summer months, that allow people to enjoy and learn about the area in a variety of ways. People of all ages, including children, can find programs to enjoy including bird walks, bike rides, interpretive hikes, and arts and crafts programs. There are hikes with dogs, art sessions, Junior Ranger programs, sunset hikes and special annual events relating to the project. Clean-up projects are ongoing and always could use volunteers! You can peruse the list of classes and programs that are held at the Rio Salado Habitat Restoration Area online and register for them there. Some programs have fees and some are free. The Rio Rambler Program offers those with their own horses an opportunity to ride on the ten miles of trails within the restoration area. You'll find a water trough, hitching posts, horse-trailer parking and restrooms at the Equestrian Trailhead at 2801 South 7th Avenue. Like to hike on your own? Go to it! There are several trailhead access points at the Rio Salado Habitat Restoration Area. Rio Salado Habitat Restoration Area Factoid: At the monthly guided bird walk, Park Rangers will lend you binoculars if you don't have your own. More than 200 species of birds have been recognized here. I say recognized, and not just seen, because an experienced birder can also distinguish the sounds that birds make. You can view and print this Rio Salado bird checklist. Experienced birders can always visit the riparian corridor on their own. I need someone to point me in the right direction and then tell me what I'm seeing, so, if you are like me, the monthly guided Bird Walk is the answer. The Bird Walk covers between one and two miles of the riparian area at a leisurely pace. On the day that I participated in the walk, the birds that the group saw (or heard) included the osprey, sharp-shinned hawk, ash-throated flycatcher, neotropic cormorant, double-crested cormorant and the pied-billed grebe. Our guide noted more than 30 species that morning. The guide for our Bird Walk, Tom Gaskill, made the morning very enjoyable. He'll be able to quickly judge the experience level of his group. Don't worry if you are a beginner at birding -- no pressure here. He'll answer the most basic of questions and make it an entertaining and educational experience. Bring a hat, water, binoculars, and a field guide to birds, if you have one. There is a charge for this program. From Tom Gaskill: "The birds on page three are lovely male house finches. Here's one of my favorite bits of trivia about house finches. The color of the males has some regional variation, but it's more controlled by the amount of carotenoids in their diet when they're molting. The one on the left is quite orange and doesn't have a lot of color. The one on the right is rich red. He listened to his mother and ate his carrots." Rio Salado Habitat Restoration Area Factoid: Tom's favorite field guide for our region is "A Field Guide to Western Birds" (Compare Prices). The Rio Salado Habitat Restoration Area is an oasis in an part of Phoenix where people might not expect to find lush trees, plants and wildlife. If everyone follows these simple rules, the project can continue to progress and the community can enjoy it. You may visit the Rio Salado Habitat Restoration Area from sunrise to sunset all year long. You may bring your dog to the Rio Salado Habitat Restoration Area as long as you keep it leashed, stay on the paved trails, and clean up after it. No alcohol permitted, no glass containers. The lake is not stocked. There is no fishing permitted here. No swimming or wading. In other words, stay out of the water. No music, unless your are the only one who can hear it. No soliciting or commercial sales are permitted. No motorized vehicles are allowed outside the parking lot. That includes scooters and any other wheeled devices. Rio Salado Habitat Restoration Area Factoid: The Arizona Water Protection Fund played a key role in Rio Salado's development. That government commission supports projects that enhance riparian areas. Here is a map showing the locations. Parking is free at the Rio Salado Habitat Restoration Area. There are modest fees for participation in planned programs at Rio Salado. Reservations for programs are required. For more information about the Rio Salado Habitat Restoration Area, call Rio Salado at 602-262-6863 or visit them online, where you can also find the upcoming schedule for programs and tours.